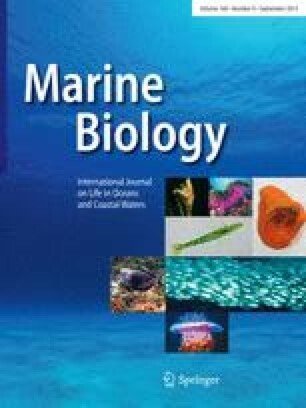 Using the starvation technique, changes in protein and free amino acids were examined in Penaeus esculentus Haswell collected from Moreton Bay, Australia, by trawling in 1985. Prawns of 17.7±0.26 g wet weight were held at 25°C until 2 d after moulting. Groups of seven or eight were then starved fro 5, 10, or 15 d, with appropriate control groups. At the end of each period, ecreted amino acids were collected for 24 h and whole-muscle amino acids and free amino acids (FAA) g-1 in each prawn were analysed. Concentrations of whole-muscle amino acids showed only minor changes with starvation, but concentrations of many of the FAA changed significantly. Total FAA averaged 1 182±45 μmol g-1 dry weight. Individual FAA, in order of abundance, were glycine, arginine, proline, taurine, threonine, hydroxyproline, alanine, glutamic acid, valine, aspartic acid and lysine; the remaining FAA each contributed <0.2% of the total. Only taurine and alanine did not show significant changes with starvation. Concentrations of glycine, arginine, hydroxyproline, glutamic and aspartic acid increased, while those of proline, threonine, valine and lysine decreased with starvation, that of proline approaching zero after 15 d starvation. Excreted amino acid-nitrogen represented <2% of excreted ammonianitrogen ornithine being the most abundant (35%), followed by leucine (22%) and lysine (17%). The relative abundance of excreted amino acids did not correspond with those of the FAA. It is suggested that, as starvation progresses, the muscle protein is progressively hydrolysed, but with the remaining muscle maintaining its amino acid composition. The liberated amino acids enter the FAA pool and become available for energy production. Proline may have an important role as an energy source, but the ability to synthesise proline may be limited, and thus the artificial food of penaeid prawns may be improved by its addition.